Did the Ellmore campaign lie? However, according to Blacknell, no such statement was ever made. On several occasions, including to Bearing Drift, Singh has pledged his support to Sen. McCain. Singh also attended the opening of the national McCain Headquarters in Arlington. So, is the Ellmore campaign lying? I contacted the campaign last evening to find out why they sent this and a spokesman responded by saying this piece was in response to a mailer sent by the Singh campaign. I requested to speak with Ellmore to find out more and why the claims about Singh’s views were characterized the way they were, but he was unavailable. According to Singh, no such statement or caption appears in the Post. Mark Ellmore ran for the Republican nomination in 2006, losing to Tom Odonoghue, who was subsequently defeated by Rep. Jim Moran by 35% of the vote, 66-31. Amit Singh began his campaign for Congress in March. Moran is expected to easily win the Democratic nomination and is seeking his 10th term. 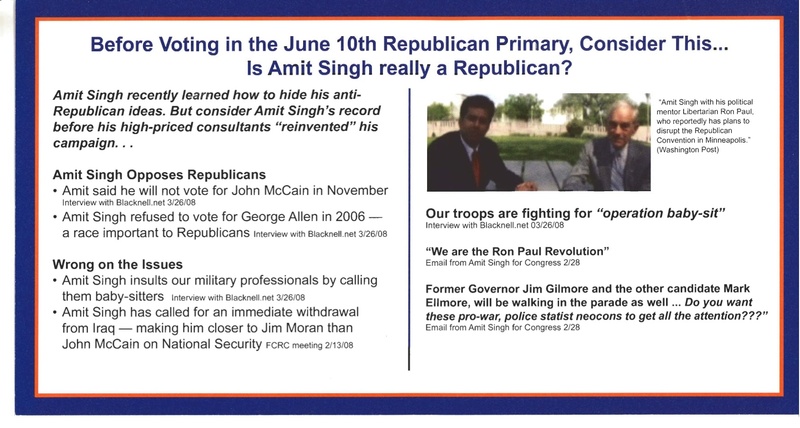 In a recent smear campaign mailer targeting Ellmore, the Singh campaign falsely portrayed Ellmore as someone opposed to a fence on the border. “Ellmore has been clear on this issue since day one: secure the borders first and build a fence today,” said Daniel Tillson. In the same article that Singh referenced in his mailer, Ellmore is quoted saying, “I do believe in securing the border with a fence,” directly contradicting Singh’s accusation. Singh further accused Ellmore of receiving money from an AFL-CIO union. The contribution in question was a one time donation received in a separate campaign from the local Fire Fighters Union. “It is egregious to cast such a shadow on a group which risk their lives daily for our community”, state Ellmore spokesperson Mike Lane. Email a friend: Did the Ellmore campaign lie?